The Pati valley is considered one of the most beautiful treks of Brazil. Disconnect 3 days from the rest of the world and reconnect with yourself and the surrounding nature. This 3 day hike is recommended for those who want to go the most popular attractions of the Pati valley (Vale do Pati). You are in a very good physical condition to face some challenges : steep climbs and descents, taking off shoes to cross rivers, climb over some rocks, walking long distances. Your guide may have to change the itinerary depending on the weather conditions. Some parts can get really tricky or even dangerous. This description is written for a trekking under normal weather conditions. Your guide brings cereal bars, fruits and cookies as a snack and makes a lunch with bread, cheese, tomatoes, etc..
A night in a house of locals is an adventure on itself. Your guide knows the locals well and will bring you in contact with them. You sleep in a simple and clean bedroom. In a shared bathroom you can enjoy a cold shower and use a normal toilet. The buffet breakfast and buffet dinner are ALWAYS delicious ! As the locals are self sustainable they make their own bread, cakes, juices, tea, etc… They use strictly vegetables from their own garden. In the high season there are always other groups of tourists in the valley and it is nice to tell stories about your hiking experiences. In the low season it can happen that we are the only group that overnight in the houses. We leave Lençóis by car at 08:00. After 1 hour of asphalt road and 1 hour 15 min of dirt road we arrive at 09:30 on the beginning of the path to the Pati valley. Big part of the first day is on a plateau with no trees at 1300 meters ( 4200 feet ). Use a good hat and lots of sunscreen ! After a climb of 40 min we arrive on a wide plateau. When it rained the night before the only difficulty is the water on this flat trail. Sometimes we will need to take of shoes to cross a small river. It is exciting to approach the Pati valley with every step. After approximately 1h 45min you are about to see one of the most breathtaking views of your life ; it is called the “Mirante do Pati” ! It is like you step into a film ! 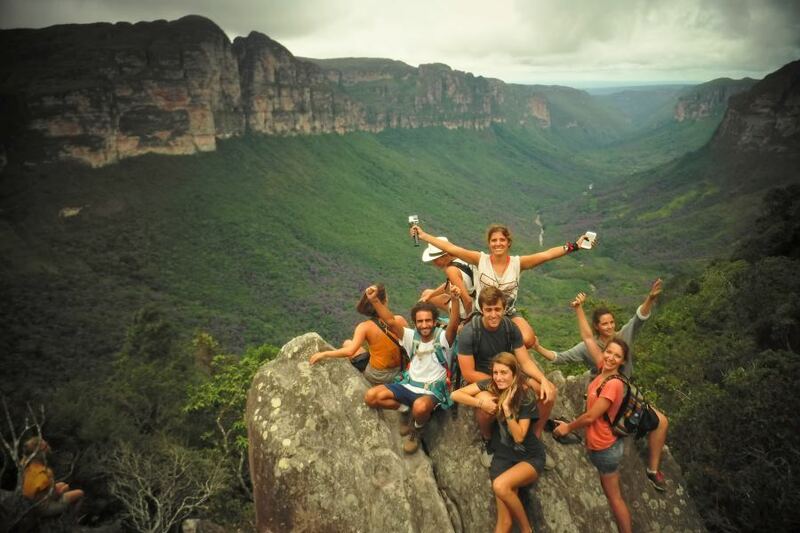 After a good lunch with one of the best views of the Chapada Diamantina mountains, we continue our trek. We go for a late afternoon dive in one of the delicious waterfalls of the Pati valley. Dinner will be served around 19:30. Depending on the weather conditions we will go in the morning to the “Castle mountain” and the afternoon to the waterfalls. This description is written with the “Castle mountain” in the morning. After a delicious breakfast at 07:30 , we start our day hike at 08:30. We take only a light backpack for this day. We need to climb for 1h 30min. The climb is mostly in the forest with lots of big rocks and some muddy places. In extreme weather conditions this climb is too dangerous. When raining, the risk of accidents increases. On the “Castle mountain” or “Morro do Castelo” you will have again a stunning view. It is worth the climb and sweat and tears ! On top of the “Castle mountain” we need to climb some difficult rocks to get to the other side of the mountain for another great view! There is a little surprise on top of this “Castle Mountain”! The descent is even more difficult than the climb but there are some trees to hold on. In the afternoon the path is not difficult and you will have time to relax and swim in the beautiful waterfalls of the Pati valley. Enjoy your last night in this amazing valley ! We start the day early because we need to walk around 21 kilometers. We begin the day with a climb of about 250 m and the rest of the day we walk on nearly flat trails or downhill but nothing too technical. Around 12:00 we will arrive on the great canyon of the Cachoeirão valley. Stunning pictures can be taken here ! Be aware that you will be hiking for 7 hours every day if you choose this trek ! -With lots of rain, the path to the falls is full of water. Big part of the trails are between 1000 m and 1300 m and have almost no shadow ! Lots of sunscreen and a good hat !